The way news is reported and the movies we choose to watch play an important role in how we view the world. This week on State of Belief, Interfaith Alliance’s radio show and podcast, we’ll explore the interplay of religion and media, from the news we consume to the movies we watch. 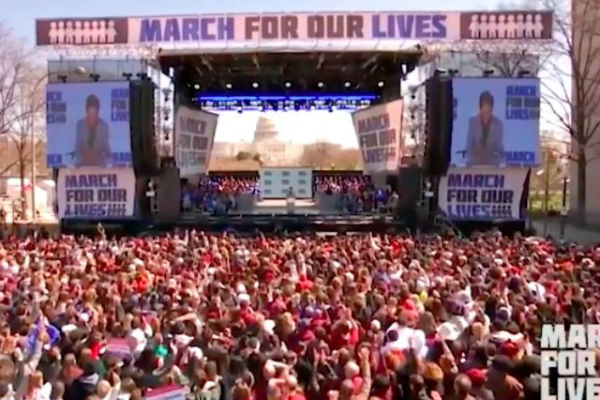 Last weekend, hundreds of thousands of students and their supporters took to the streets across the country for the March for Our Lives. This week, the same student activists have organized a series of town hall events to push lawmakers to take a stance on gun violence prevention. William Saltzburg, who spoke with host Rev. Welton Gaddy last week before the march, will join us again on State of Belief to talk about what the experience was like – and what comes next. Will is a student from Pennsylvania and vice president for membership at NFTY – the Reform Jewish Youth Movement. A new report from the Institute for Social Policy and Understanding backs up the perception that Muslims are treated differently in this country by both law enforcement and media. The study, entitled Equal Treatment? : Measuring the legal and media responses to ideologically motivated violence in the United States, finds that alleged perpetrators of violence who are perceived to be Muslim, including those who are not actually Muslim, often face more several legal charges, receive longer prison sentences and receive more media coverage than non-Muslim perpetrators. Study authors and Institute fellows Kumar Rao and Carey Shenkman will join Welton this week to talk about the highlights of the new report and its implications. A few years ago, a film titled God’s Not Dead seemed to defiantly challenge not only Nietzsche, but the imaginary Atheist threat the religious right seems to believe is dominating our culture – and brought in more than $60 million doing it. But two sequels since have failed to live up to that level of success. Welton will be joined this week by Alissa Wilkinson, the film critic at Vox, to talk about the films and her new piece, The Christian movie series God’s Not Dead fails to be Christian.